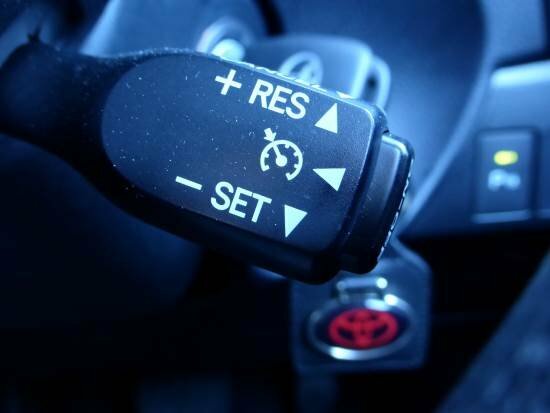 Home › Advice › Is it safe to use cruise control in the rain? Is it possible for cruise control to cause you to crash when the road conditions are slippery? There’s an email that’s been circulating for years (at least since 2002) which purports to explain such as situation – a woman is driving along, using cruise control, and suddenly she loses all control and “literally flies through the air” and ends up crashing. Fortunately she’s not badly injured. Is this just someone who was useless at driving, or is it a lie, or maybe just an exaggeration? It turns out that it’s an exaggeration, so let’s first see why ‘cruise control’ could become ‘lose control’. Cruise control works by monitoring your car’s speed and then adjusting the throttle inputs to keep it at the same speed. It’s usually only accurate to within 3-5kph so it’s not a good idea to set it to 107kph because you will almost certainly exceed the police’s tolerance occasionally. To maintain speed the engine has to fight against wind resistance, friction and power losses in the gearbox and differential, and the rolling resistance of the tyres. If you are driving uphill, there’s gravity to take into consideration, too. Therefore when driving, the engine is always working because there’s always something pushing against the car, unless you are driving on a sufficiently steep downhill gradient that gravity means you will speed up even with no throttle input. Some systems also have a speed limiter, or a warning if you exceed the local speed limit. Is cruise control dangerous in the rain? The answer is no, but only if you have traction control and electronic stability control enabled in your car. Ice, slush and snow is a different matter because you wouldn’t be travelling fast enough to warrant using cruise control and many vehicles don’t let you set cruise control at less than around 30kph. If you do not have traction control or stability control then cruise control is dangerous in heavier rain or where there is standing water. The reason is because unsophisticated cruise control systems on older cars (or cheaper new cars) will continue to apply more power if it detects that it needs more power to maintain a particular speed. What makes this dangerous in the wet is aquaplaning (or hydroplaning). Aquaplaning is where your wheels ride up on a cushion of water, essentially skating over the surface of the water, because the tread in the tyres is not sufficiently deep to disperse it fast enough. When you are aquaplaning you have very little grip and therefore any acceleration applied to the engine will be able to make the wheels spin faster more easily. In the case of the woman that crashed what would have happened is that she would have aquaplaned, the wheels would have spun which would have raised the pitch of the engine, making it seem like she was going faster even though she wasn’t, then she left the road and crashed. If you get into a skid do you know what to do? Advice given in the Road Code for correcting skids is now outdated and dangerous. Find out why by checking out this. And if you do end up crashing you are going to be glad if you picked a car with a good crash test rating. Find out all about how you can choose the best car using published crash test ratings. ‹ Rumble strips: what are they used for?